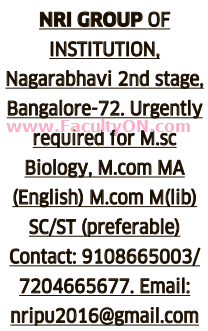 NRI Group of Institution, Bangalore has advertised in the DECCAN HERALD newspaper for recruitment of Lecturer jobs vacancies. Interested and eligible job aspirants are requested to apply immediately from 11th July 2018. Check out further more details below. College Profile: NRI- St.John’s group of colleges are renowned educational institutes with existence of 30 years in field of education. As a learning process we have started our journey of imparting education at School level. This of our thought is very important to understand growing process of tiny tot to an adult and need of future college student. Today with this learned knowledge we are offering specialty courses of career orientation. How to Apply: Interested and eligible candidates are requested to send bio-data along with copies of certificates / testimonials and recent passport size photos to the email address provided below. Or contact through phone.